You might remember your grandparents closing the shutters when the weather got rough. 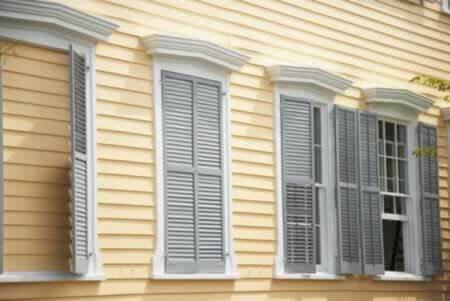 Shutters over single-pane windows were always considered a good idea, both for the sake of protection and energy-efficiency. These days, double-pane and triple-pane technology provides much sturdier windows than those of yesteryear, so shutters are no longer a necessity, however, the sheer beauty of them has many homeowners bringing back the charm! Shutters that close tightly over your windows can provide an extra layer of protection, as they did back in your grandparents' day. But they can also block out the light when you need to sleep, make your home feel more secure, and add a unique charm to your windows that can boost the resale value of your home. In some cases, shutters can be used to create "faux" windows on your home, an exterior design element that can make uneven or odd-numbered windows look more uniform.